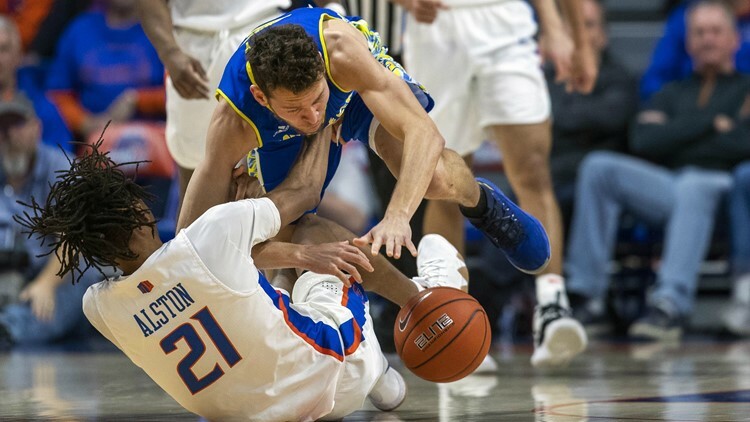 Boise State guard Derrick Alston tumbles to the floor after tying up San Jose State's Brae Ivey Saturday, Feb. 9, 2019, at Taco Bell Arena in Boise, Idaho. Boise State won the game 105-57. Boise State is bubbling under for the right to take the first day off in Las Vegas four weeks from now. But the remaining schedule presents plenty of hurdles for the Broncos to clear. BOISE, Idaho — Tuesday, February 12, 2019. It’s crunch time in the Mountain West. The top five finishers in the standings earn coveted first-round byes in the conference tournament next month. Nevada, Fresno State and Utah State are basically guaranteed three of them. That leaves six teams realistically battling for those other two spots. San Diego State is 6-4 in Mountain West play, Boise State and UNLV are 6-5, Air Force is 5-6, and New Mexico and Colorado State are 4-7. So who may have the best shot at the byes? Well, the list is inverted in terms of strength-of-schedule. The Albuquerque Journal points out that the Lobos and Rams have the easiest path on paper, as their remaining opponents have won only 38 and 43 percent of their games this season, respectively. At the difficult end are Boise State at 53 percent and San Diego State at 60. Nevada dropped to No. 7 in the AP Poll this week despite avenging its only loss of the season Saturday. The Wolf Pack roughed up New Mexico by 29 points after losing by 27 to the Lobos six weeks ago. But the Pack only beat Colorado State by, um, 16 last Wednesday on the road. The NCAA Selection Committee’s first bracket preview Sunday is being skewered in Reno for tabbing Nevada as a No. 4 seed (the committee ranks it No. 14 in the overall bracket). The Pack’s problem is strength-of-schedule. Nevada is 22-1 and has a lot of lopsided wins this season, but no quality ones. And there’s nobody in the Mountain West that’s going to help the situation from here on out. If the Wolf Pack is a fourth seed now, it’ll probably be a No. 4 on St. Patty’s Day. This we know: Boise State is very fortunate to have Andy Avalos going into his sixth season as defensive coordinator at a rate of $350,000 per year. Sure, that sounds like a lot of money to you and me, but in the world of high-performing college football coaches, that’s a stone-cold bargain. Assistant coaches salaries are up for Idaho State Board of Education approval this week, and Avalos’ proposed raise is $15,000 over the next two years. Many wondered how the Broncos would be able to so much as hold on to Avalos, but away we go. The other eye-catching figure on Boise State’s list: a $40,000 decrease for Kent Riddle, who gives up the special teams coordinator’s post this year. One-time Boise State quarterback Danny Langsdorf has been named either offensive coordinator or QB coach at Fresno State, depending on which report you read (he’s not listed on the Bulldogs’ website yet). Langsdorf is a veteran of the coaching wars, having been most recently an offensive analyst at Oregon. He’s also had NFL stops with the Saints and Giants and served as Mike Riley’s O-coordinator at Oregon State and Nebraska. Langsdorf spent three years as a Bronco quarterback before transferring after Tony Hilde became the starter during the 1993 season. He finished his career playing for his father, Ed, at Linfield College. Meanwhile, a Boise State alum has left the Bulldogs staff to ply his wares in the CFL. D.J. Harper is the new running backs coach for the Hamilton Tiger-Cats after spending two years as a Fresno State grad assistant. Wide receivers coach Kirby Moore is still in Fresno, though. And former Bronco center Klayton Adams lasted only four weeks as offensive line coach at Wyoming. The chance to get his feet wet in the NFL was too tempting, as Adams has been hired as assistant O-line coach with the Indianapolis Colts. He coached the past six years at Colorado but was back on the market upon the firing of CU coach Mike MacIntyre. Women’s basketball is strong at all levels around the Gem State this winter. There’s Boise State, which is 19-3 and leads the Mountain West. ESPN’s Bracketology has the Broncos as a No. 12 seed in the NCAA Tournament. Boise State also has the newly-named MW Player of the Week, Braydey Hodgins, who scored 49 points and shot 59 percent from the field and 53 percent from three-point range in two wins last week. It’s the second MW honor this season for Hodgins—she also earned the award in December after being named MVP of the Husky Classic. Northwest Nazarene is still tied for first with Alaska-Anchorage in the GNAC with identical 13-1 conference records and 21-1 overall marks. NNU was supposed to host Central Washington today, but Snowmageddon in the state of Washington wouldn’t allow CWU to travel. First the Wildcats were going to bus, but I-84 was closed over the Blue Mountains. Then they were going to fly, but all flights were cancelled out of Yakima. The game has been rescheduled for next Monday night. And there’s Idaho, who has a half-game lead over Idaho State atop the Big Sky. Since a 3-6 start in November and December, the Vandals have gone 10-2 in league. Kaitlyn Farrington, who grew up on a ranch near Bellevue and cut her snowboarding teeth at Sun Valley, wins the gold medal in the women’s halfpipe at the Winter Olympics in Sochi. Farrington laid down a spectacular final run to edge defending gold medalist Torah Bright and former gold medalists Kelly Clark and Hannah Teter. It was the first Winter Games gold for an Idahoan since Picabo Street took the super G in Nagano in 1998. The only other gold medalists with Idaho ties were Boise’s Bill Johnson in the downhill in 1984 and Sun Valley’s Gretchen Fraser in the women’s slalom in 1948.